A regular player at South Africa's Thunderbolt Casino sat down to play some slots at about 4:00 pm the other day, like he often does. 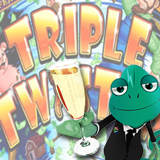 By five o'clock he'd won R82,358 playing the popular Triple Twister slot from Realtime Gaming. Now that's what I call "afternoon delight"! Steph Z., 61, said he was feeling lucky that day but really didn't anticipate such a great winning spree. He plays slots to relax but was feeling anything but calm after his exciting afternoon. "My wife had a nice dinner prepared for me," he said from his home in Johannesburg, "But I was much to excited to eat, that's for sure!" "We’ve seen lots of nice payouts on this game," said Alisa, the Casino Manager at Thunderbolt. "But I’ve never seen anyone rack up over R82,000 that quickly!" Up to 70 free spins and up to R1000 casino bonus available to try new Megaquarium slot from Realtime Gaming. Triple Twister is a popular game from RTG that’s available online for desktop and laptop computers and in Thunderbolt’s mobile casino for smartphones and tablets. It has a bonus round triggered by three or more Weather Vane scatter symbols. And its Win-win feature ensures everyone wins during those nine free spins. But it may be best known for its animated tornado – a Wild symbol that expands to fill its entire reel. Thunderbolt Casino, where all games are played in Rands and customer service is available in both English and Afrikaans, offers hundreds of games from Realtime Gaming including the brand new Megaquarium slot. Megaquarium is a colourful game set in a tropical reef inhabited by happy Clown Fish. Bonus prizes get bigger and bigger as one bonus game leads to another and then to the ultimate Mega Bonus round. Until the end of the month South African casino players can get 50 free spins on the new game and claim a generous introductory deposit bonus that includes 20 more free spins. All players that have made a deposit in February are eligible for this free bonus. Bonuses are valid until February 28, 2017 only.